Manufacturers of chocolate, candy, gum and mints directly employ nearly 54,000 people across the United States, with more than 550,000 jobs supported in related industries, including agriculture, retail, transportation and more. Read the press release on NCA’s 2018 economic impact report. Learn more about how confectionery manufacturing is impacting the economy in your state by clicking on the map below. Our leadership and community involvement goes beyond the candy aisle in the grocery store. The confectionery industry has a long-standing history of corporate social responsibility. Engaging in sustainability programs, our member companies are working hard to ensure that every stakeholder in our entire value and supply chain wins – from farmers to our retail customers. The impact of this strong, thriving, innovative industry echoes across the country, where these companies are helping make life a little better. We are creating American products with American workers in cities and towns throughout the United States. Candy is a special treat that has played an important role in cultural traditions and seasonal celebrations for thousands of years. We make a wide variety of options – available in packages ranging from fun size to share size – that can bring a little enjoyment to any occasion. We’re committed to marketing our products responsibly. The industry’s largest candy companies have joined the Children’s Food and Beverage Advertising Institute (CFBAI), and several other companies have joined the Children’s Confectionery Advertising Initiative (CCAI). We’re empowering consumers to make informed choices. Front-of-pack label information puts calories for the full package at consumers’ fingertips, helping them manage their sugar intake while enjoying their favorite treats. America’s leading chocolate and candy companies are committed to providing consumers with information, options and support as they enjoy their favorite treats. In the next few years, consumers will see tangible changes in the marketplace as a result of our Always A Treat Initiative, including the availability of smaller pack sizes, portion guidance and clear calorie labels right on the front of the pack. Announced in May 2017, this initiative is a five-year commitment with the Partnership for a Healthier America, a highly regarded nonprofit organization that will help us track and verify this meaningful initiative. Our progress will be monitored and reported to PHA in conjunction with a well-respected, nonpartisan policy research organization called the Hudson Institute. Learn more. 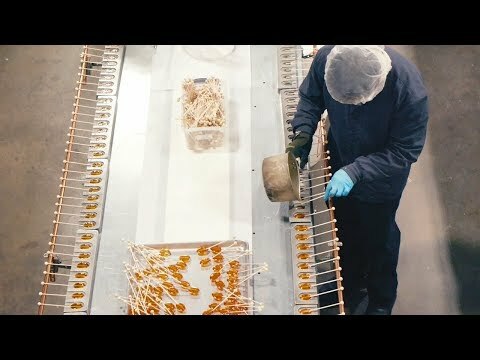 The confectionery industry directly employs nearly 54,000 people in the United States, and supports more than 550,000 jobs in other industries. Here’s a glimpse at how the industry impacts the state.